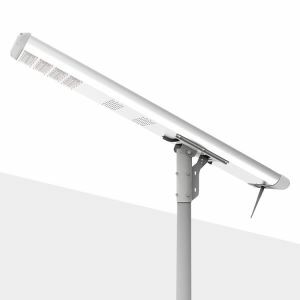 Hyperion Series Outdoor All In One Solar LED Street Lighting has a wide range of application including but not limited to Parking Lots, Street, Sidewalks, Pathways or Security perimeters. 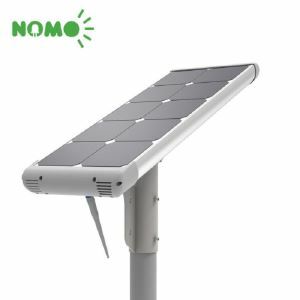 Comparing with the other brand solar streets, we also offer patent smart lighting control system for option, you can check the lights at any place any time via this system. 1Hr 50% ,4Hrs 100%,3Hrs 50%,4Hrs 25%. * Simple yet beautiful, convenience with an integrated design. 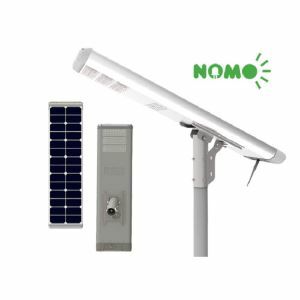 * Environment friendly, solar power supply, zero emissions. * Energy saving, light Brightness for longer period. * High brightness LED modules, intelligent MPPT controller, optional motion sensor. * High efficiency, easy installation. * Surface is anti-corrosion treated, salt fog up to 480 hours, rust proof. * Designed with highly-efficient monocrystalline silicon. * High efficiency long-life light source, which is up to 50000 hours. Solar energy is a form of renewable energy. 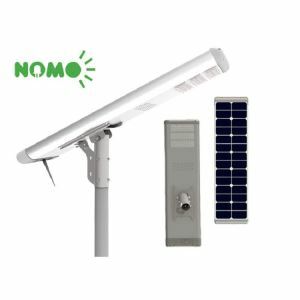 The solar energy is captured by photovoltaic cells of a solar panel and converted into electricity by recharging a battery used to light LED lamps. These cells get recharged during the day and are used for lighting the streets after dusk. How about the working time? Normally, it can work 3-5 days after charging. It’s hot sell series, we have enough stock.